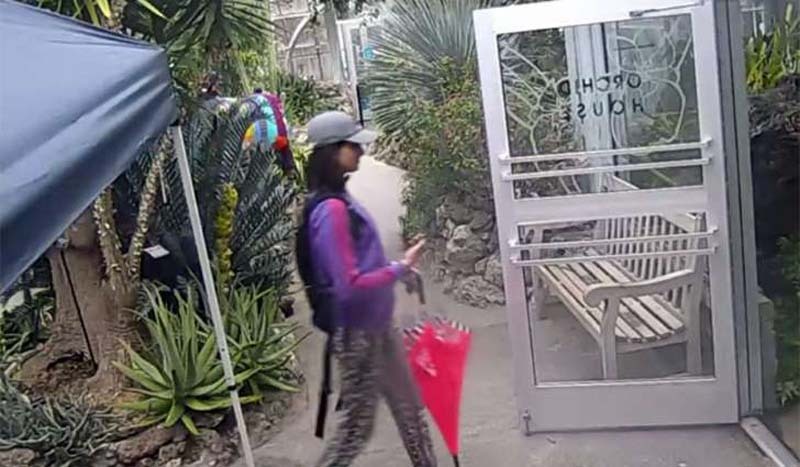 © Provided by Fox News Police in Cincinnati are looking for this woman who they say was caught on video surveillance stealing a rare butterfly from the Krohn Conservatory. A brazen thief was caught on camera stealing a rare butterfly from an exhibit at an Ohio conservatory, according to reports. A woman in a baseball cap made off with a bright-colored Blue Morpho African Butterfly last Sunday at the Krohn Conservatory in Cincinnati, leaving police and biologists dumbfounded, local media reported. "I have never heard of anyone stealing a live butterfly from a butterfly show," University of Cincinnati biology professor Stephen Matter told WCPO-TV. The surveillance video footage shows the thief slipping in and out of the exhibit, according to Fox 19 Cincinnati. An employee is then seen confronting the woman and attempting to stop her from leaving, but the woman was able to get away. The group Rainforest Alliance says the blue morpho's beauty attracts artists and collectors from all over the globe. A framed blue morpho can sell online for as much as $60.